The Redolent Mermaid: *CLOSED! WINNER! * School's in Session for the Mermaid: Giveaway! *CLOSED! WINNER! * School's in Session for the Mermaid: Giveaway! In honor of heading back to work at the middle school I am hosting a giveaway! This is a tidy little lot of some great vendors and scents that can help you celebrate all things Autumn. There will be a few more thrown in from some recent orders that are not pictured. If you would like to enter, please leave a comment telling me the one thing you look forward to the most in the fall. I have to say the rare handful of cool crisp days without a speck of humidity and bright blue skies that central Florida has around October/November. The giveaway will close Friday before I go to bed. Have a Blessed Day! Cheers! 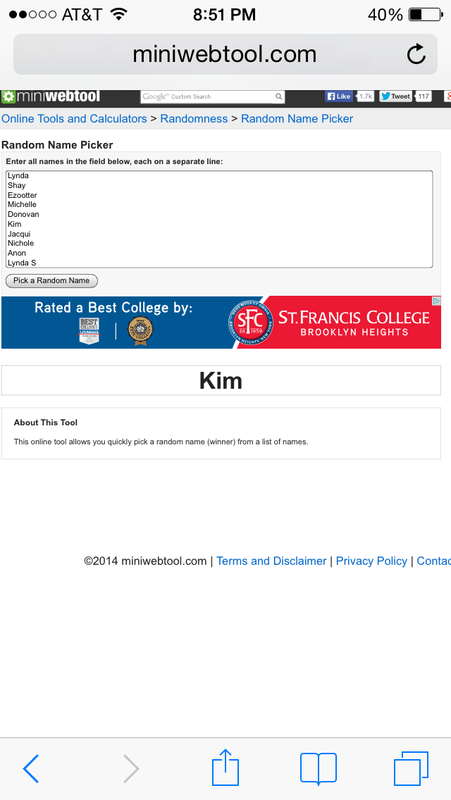 CONGRATS KIM!!! I promise I entered all the names up to Carmen, they just do not show them all on this site. :-) I will be mailing out you box this weekend! Thank you all for participating. What a wonderful giveaway, Julie!!! I'm tempted to say what I look forward to the most is melting apple and pumpkin tarts everyday, but in all honesty nothing can top the beauty of trees changing color!! Hoping you have a blessed day also! The changing of leaves and being able to melt my wax without my air conditioners or ceiling fans interfering. Hi Shay! Yes! Those fans and A/C vents can kill a scent. Unfortunately i live where they need to run 10 months out of the year. But those 2 months they don't are bliss (on the electric bill too). Good luck! Living in So. Cal it seems we only have Summer all year round, I wish we had at least rain every once in a while. Thank you for the Giveaway. Obviously living in the tropics means I have no changing seasons either but we have been in the midst of a bit of a rain and my favourite part is waking up to a cool morning, and snuggled warm in bed! Good Afternoon Michelle!! Yes, snuggling under plush blankets while it drizzles outside is such an indulgent pleasure! Mmmm!!! Good luck! I'm new to wax tarts and stumbled onto your site via Fragrance Obsessed. My favorite thing about fall is that the cooler weather is perfect for dressing in layers! Sweaters, pea coats, tights, boots, and scarves. ♡ Thanks for the giveaway! Hi Donovan! Welcome to this crazy smelly wax world! And thank you for stopping by! Oh I agree! For me it is scarves, jeans, cardigans and dark polish and lipstick and tobacco, amber, and pine perfumes. I love layering :-D good luck! Thanks for the giveaway! I love your blog! I am looking forward to kids going back to school, the cooler weather, leaves changing colors, Halloween and my birthday in October (even though I am too old to celebrate LOL). Hi Kim! Thank you for reading! I go incognito on FB and see you around :-) you have great wax taste! I hope you have a fabulous birthday this year, and you are never too old to celebrate! Cheers! Good luck! Oh fall, how do I love thee? Let me count the ways. Sitting at the top of the hill of our local apple orchard gazing down on all the changing colors of the leaves and sipping hot apple cider. Bonfires with friends on chilly nights wearing big, cozy sweaters all the way over my hands to hold my cold pumpkin beer. Celebrating my anniversary and remembering our Halloween themed wedding while flipping through our guestbook with snapshots of our loved ones dressed up in costumes. The warm feeling when you first notice the leaves changing on the trees. Roasted and salted pumpkin seeds baking in the oven after pumpkin carving is complete. Boots. Decorating the house with rustic touches of the season while melting spiced scents and listening to dulcimer folk music. Horseback hayrides through our glorious metroparks with a chunky scarf to block out the brisk air. Watching my nieces and nephew dress up as their favorite fictional characters of the moment and seeing them filled with joy from the anticipation of trick or treat. Just one thing, you say? Impossible!! Okay, okay. Pumpkins! Oh! Jacqui! I die! Your words make me so nostalgic for something I have never even experienced. Maybe I can talk Adam into spending some fall time in Strongsville with his family <3 You paint a beautiful picture friend. Congrats on the upcoming anniversary!!! Every year together is a blessing. What is your favorite folk record? I might not have the weather but I can get the tunes ;-) good luck and... Boots! Yes!! Please come to Strongsville! I always forget your hubby is from here, such a small world! Autumn is absolutely beautiful here. You guys must go to Mapleside Farms whenever you make it here, that's the apple orchard I was referencing. I don't feel like it's officially fall unless we make a trip there. If you have time, be sure to stop down in Amish country too, there are tons of homemade wax and candle vendors down there. And gorgeous little shops to boot. For me, Tony Elman's Shakin Down the Acorns is my ultimate fall folk album. Probably not everyone's cup of tea, but I grew up listening to it and there's just something so nostalgic about it for me. My husband hates it LOL. Thanks for the giveaway. I look forward to cool, crisp nights with hot apple cider and pumpkin patches with my kids. Pumpkin patches! I love taking the girls to pick out their pumpkins. I always get the long suffering "moooooommm" because I insist on taking way too many photos. Hot apple cider? I have never had apple cider hot. Only cold. I will have to remedy that. Thanks for entering Nichole! Good luck! Cider, pumpkins, and holloween! Love Halloween! Hard to believe all three are right around the corner almost! Anon, if you will use the contact me form and shoot me your email address so I have a way of contacting you in case you win, That would be great! Thank you and good luck! I love the cooler weather which means no heat or AC! I love fall decorations and sweatshirts! Thank you for the giveaway! I agree Lynda! Those days are so glorious! When do you break out the fall decorations? Thanks for swinging by and good luck! What do I look forward to in fall? Lots of things -- little cooler weather, Halloween stuff with the kiddos, Thanksgiving feasts with family, etc. Ooh fall means Mockingjay movie too!! :-) Awesome giveaway & great idea!! Mockingjay! Yea yuh!!! Can't wait to see that with you! Maze runner in September too I think? I love thanksgiving too. One of my favorite days. Good luck Tricia! Being able to open the windows and bask in the cool breezes...and enjoying NY's stunning fall scenery! Hi Sarah! New York! Headed there for the first time in November. Not sure how much fall splendor I will be able to see in the city but I am stoked! Thank you for sopping by Sarah! Good luck! I like the smell of leaves and wearing hooded sweatshirts. Hoodies are great! Good luck choseck! Yezzz... football is big around the Johnson household! Go Gators! Good luck! Julie thank you so much for this awesome giveaway! I am so excited!! Julie, I just received my amazing box of goodies! You made my day! Everything was packed so beautiful and they all smell fantastic! My very favorite is RG pecan waffle fluff puff but it's really hard to choose one. Thank you so so much! Yay!!!! Sorry UPS was so slow! RG Pecan Waffle Fluff Puffs is so addicting! One of my favorites for sure. I hope these make your fall and birthday a little bit sweeter!